NMM 5774. Clarinet in C by Wolfgang Küss, Vienna, ca. 1827-1830. 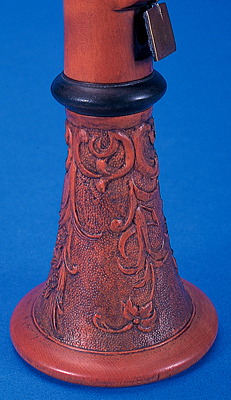 Elaborately carved barrel and bell. Boxwood, horn ferrules. Five brass keys with flat, square key covers. Five-keyed clarinets were the standard from the time of Mozart to Beethoven, but continued to be built well after additional keys had become the standard, particularly for amateur players, who wanted to play music published for voice and keyboard; hence, the high survival of examples of clarinets built in the key of C. Board of Trustees, 1994. Stamped on top joint: [Hapsburg eagle] / Küss (in script) / Wien (in script) / C; on bottom joint: [Hapsburg eagle] / Küss (in script) / Wien (in script).